Get the most from your visit to DC museums by taking this private combo tour that mixes natural marvels with iconic artists. This 5 to 5.5 hour tour will introduce you to the National Museum of Natural History and the National Gallery of Art to discover their most impressive pieces. Start at the National Museum of Natural History where your private guide will take you to visit the highlights of the collection, housed in a massive building that covers the area of 18 football fields. Gaze into the world-famous Hope Diamond, whose brilliant blue sparkle, and immodest size at 46 karats, captured the attention of former owner Marie Antoinette. Wander through the displays of gems and minerals, including the Dom Pedro Aquamarine, the world’s largest gem of its type, which glows brilliantly from within. Travel back in time to learn about death rituals while exploring real mummies from Ancient Egypt. Then step out of the past into the wild, exploring the mighty polar bears, elephants, and giraffes that roam across earth’s surface. From the land, jump into the sea at the Ocean Hall, where you’ll discover a live coral reef exhibit as well as a 45-ton whale, Phoenix, which is a replica of a real living what that the museum tracks. Then move to the National Gallery of Art and follow your guide through one of America’s best collections of artwork produced by Renaissance artists, French Impressionists, and great American painters. See works from Claude Monet, Raphael, Gilbert Stuart, Vincent Van Gough, and Edgar Degas, as well as more modern artists like Picasso, Pollock, Warhol, and O’Keefe, as you learn what’s really behind the creation of some of these pieces. Your private guide leads the way through the halls of the museum, telling stories, and stopping at famous works of art. Some pieces you’ll see on this tour include Ginevra de’ Benci by Leonardo da Vinci, Self Portrait by Vincent Van Gogh, and Woman with a Parasol by Claude Monet. Listen as your guide fills you in on the techniques behind some of the paintings, as well as some of the history and scandals that happened because of them. 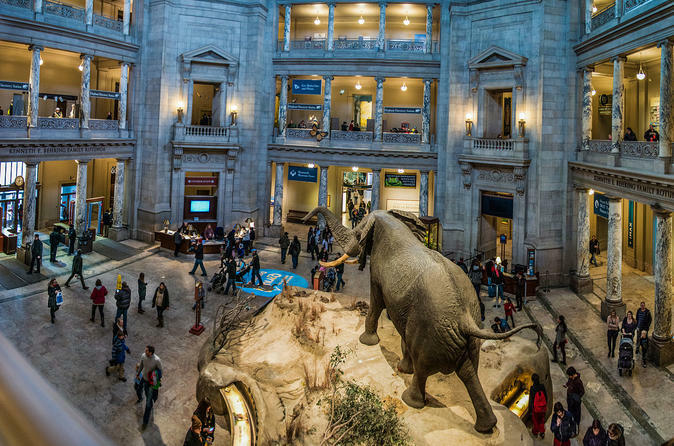 By the end, you’ll have experienced two of the Smithsonian’s most spectacular galleries in one convenient tour.